Prof. Dr. Hyoung Jin Park is currently a professor at the Dept. of Physiology, College of Medicine, Hallym University, Korea. 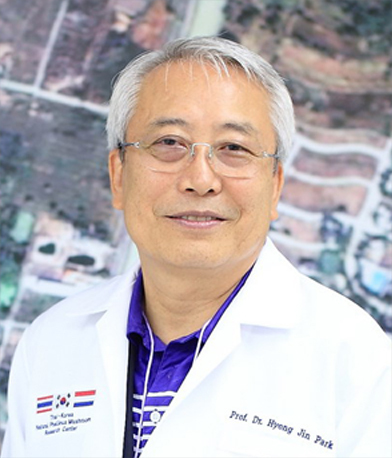 He is a member of the Korean Physiological Society, Korean Society of Endocrinology, Korean Academy of Medical Science, American Physiological Association and editorial board member of the American Pancreatic Association. Dr. Park initiated the research on Phellinus mushroom against Alzheimer, stroke and cirrhosis. His findings indicated both positive and encouraging results. Prof. Dr. Park received his M.D. from the Catholic University of Korea School of Medicine in 1971, his M.Sc. (Physiology) from the Graduate School, Catholic University of Korea in 1973. He earned his Ph.D. (Physiology) from the Graduate School, Catholic University of Korea in 1977. Prof. Dr. Park’s fields of interest included the Physiology of exocrine pancreas; Physiology of autonomic nervous system and neuroendocrine system; and the Application of medicinal mushrooms. He has published over 90 scientific papers in international journals.